5 Best Grain-Free Puppy Food 2019 - This Is Why You Want It! 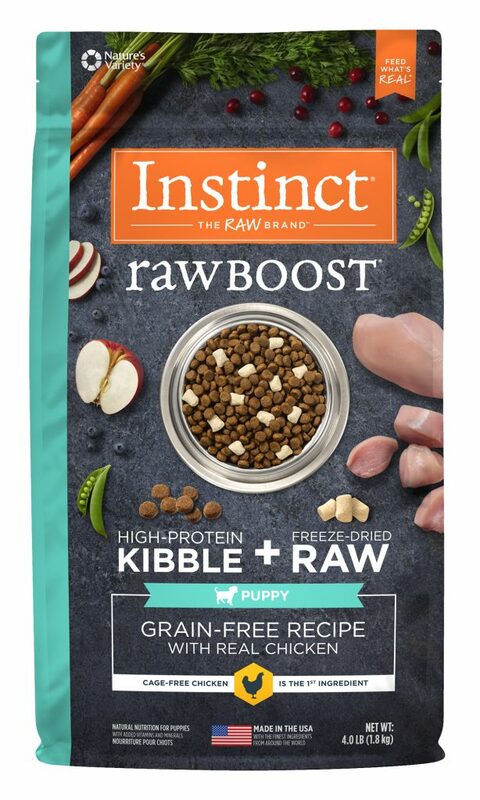 Home » 5 Best Grain-Free Puppy Food 2019 – This Is Why You Want It! 5 Best Grain-Free Puppy Food 2019 – This Is Why You Want It! Why would you want to choose a grain-free food for your puppy? Many brands use grains in their food, and if it’s that common it must be good, right? Actually, no. It can even make our canine pals sick. So, Is Grain-Free Food Better For My Puppy? Dogs don’t need grains or high amounts of carbohydrates in their food, it doesn’t do anything for them and only serves as cheap filler in the food. 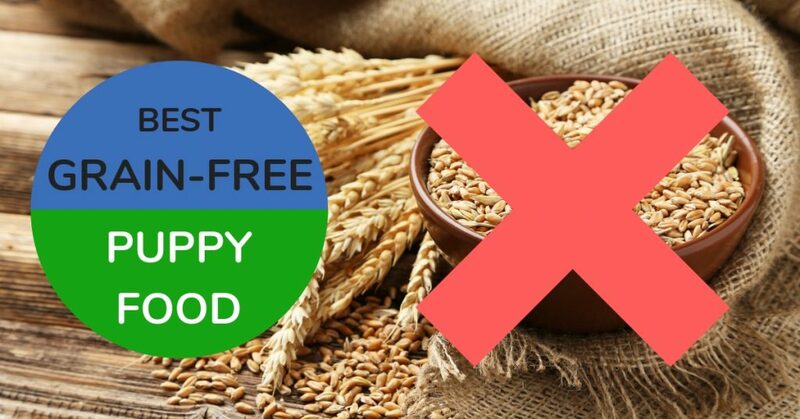 There are differences between the dog food brands who claim to be grain-free. Potatoes for example are included in some while others consider them as unncessary as wheat. So, why don’t dogs need wheat, corn, rice or other grains or potatoes in their food then? Dogs, as well as their ancestors the wolves, did not evolve on a diet containing grains, or any vegetables at all for that matter. Sometimes you hear the argument that wolves eat the stomach contents of their prey, and get plants and carbohydrates that way. This is a myth. 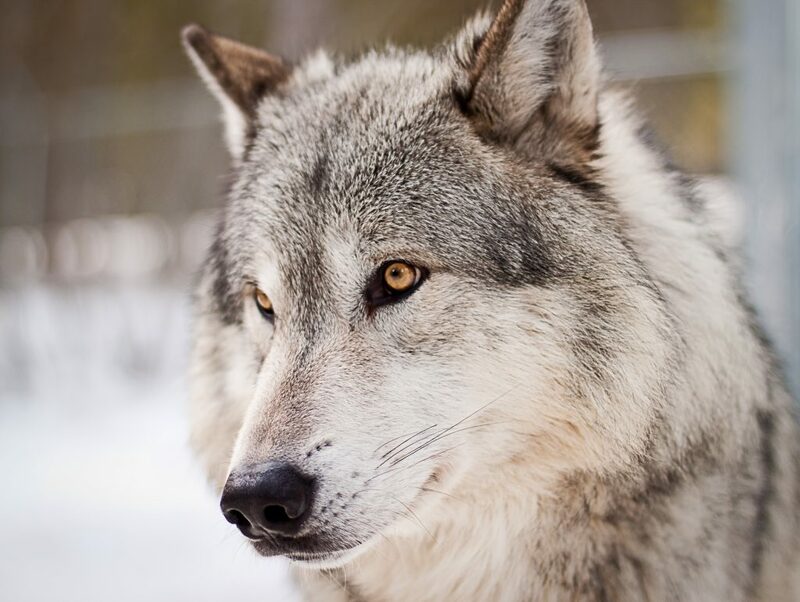 Wolves have no interest in the vegetables in the stomachs of their prey, and don’t eat it, unless the prey is very small and they eat it by mistake, so to speak. In fact, in a study where the stomach contents of 165 wolves where analyzed, only 0.1% were plants and berries. That’s right, only one thousandth of everything that the wolves had eaten were vegetables of some kind. But haven’t dogs adapted to eating vegetables? This is a statement sometimes heard, that dogs have evolved so far from the wolves that they don’t have the same food preferences or needs any more. Dogs and wolves are still the same species, Canis lupus (dogs have the addition familiaris). Their metabolism is simply not made to process and make good use of plants. That being said, dogs have evolved the capacity to tolerate grains. This doesn’t mean it’s a good food choice for them. It’s not. My main reson for saying this is knowing how wolves feed their young. Already at the age of 4-5 weeks the pups start to eat meat. But being way too young to accompany the pack on a hunt, how will they get the meat? This may sound gross, but it’s nothing less than yet another genius stroke on behalf of mother nature. When the adult wolves come back to the pups after the hunt (they have stayed at home with a couple of nannies), they throw up some of the meat they have eaten. And tada! Perfectly served wolf pup food. Exactly the same diet as the adults, but mashed and easy to eat and swallow. Below is a table you can use if you’re in a hurry and don’t have time to read the whole article. If you do have the time and want to learn more about each of the chosen foods, simply read on below the table. You can also use the Quick Navigation at the top to jump to the food you want to read more about. It’s HARD to find truly grain-free and low carbohydrate puppy food. Really hard. Most brands put potatoes, sweet potatoes, or rice in their food. That’s only replacing the carbs coming from wheat with other starchy ingredients. I have done my absolute best to pick out the brands that at least limit the carbohydrate levels. One brand stands out from the rest, in an extremely good way! This brand is my absolute favorite, the best of the best! How about 8% carbohydrates? This food, manufactured in the US, has been created by Daniel Shulof and his team at KetoNatural Pet Foods. Daniel is the author of Dogs, Dogfood, and Dogma. In the book he goes through all the science behind the fact that carbohydrates make our dogs sick, and shows how the pet food industry influences how veterinarians learn about canine nutrition. The company’s aim has been to make a dog food with “the carbohydrate content of a raw diet, the cost and convience of a kibble”. To me, it seems they have succeeded. 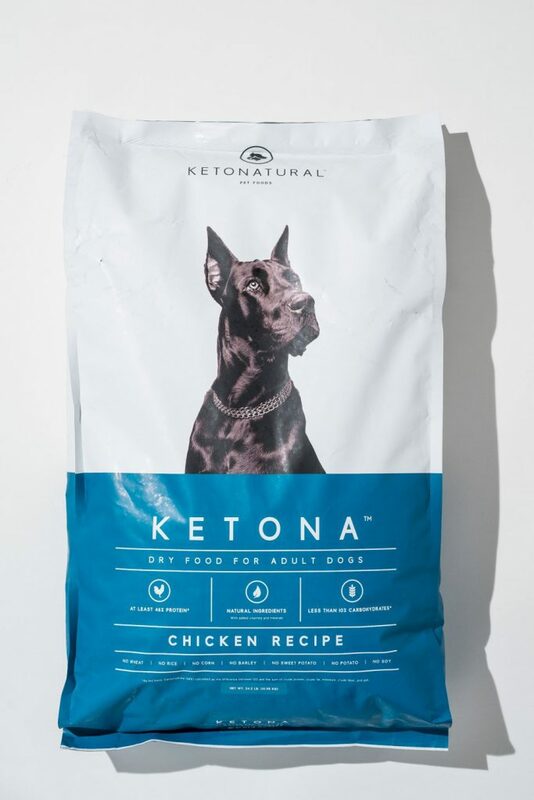 Ketona is labeled “Dry food for adult dogs”, but it has the AAFCO profile “All life stages, except for growth of large size dogs (70 pounds or more as an adult)”. This makes it a good choice also for puppies of small and medium breeds. Extremely good choice if you ask me. The kibble is small, so it suits all breed sizes. 2 out of 59 reviewers on Amazon figured the food was tasteless since their dogs wouldn’t eat it. Hard to know what that’s all about, but the remaining 57 are actually praising it. The first six ingredients are chicken, pea protein, ground green peas, oat hulls, chicken fat (preserved with mixed tocopherols), flaxseed meal . The oat hulls are only there as a dietary fiber source. As much as >90% of the protein content is from the chicken, and the rest from the peas. If you want to give your puppy a truly grain-free food that does not contain yet another kind of filler, like potatoes, Ketona is what you want. My next choice is Orijen’s puppy food. Although Orijen is produced by the Candian company Champion Petfoods, it is manufactured in Kentucky for the American market. Like Ketona, Orijen’s pup food does not contain any fillers like grains or potatoes. The carbohydrate content is 17%, way less than most other grain-free brands, but still twice as much as Ketona. Orijen is still a very good choice for your puppy. They put no grains, rice or potatoes in their food. The main protein sources are poultry and fish, but also a variety of beans and peas. Herbs, vegetables, fruit and berries make up about 15% of the ingredients. Orijen does not supplement their food with any vitamins. The only chelated mineral added is zinc. Their reason for this, according to the manufacturer, is that the food contains enough meat, bones and cartilage and in ratios that ensures a satisfying amount of nutrients. The puppy food has the AAFCO profile “All life stages”. There is nevertheless an option called “Puppy Large”. The difference between them is that Puppy Large has a about 15% less energy per same amount of food compared to regular Puppy. This prevents a large or giant breed puppy from gaining excess weight that could cause joint deformities in the growing young dog. 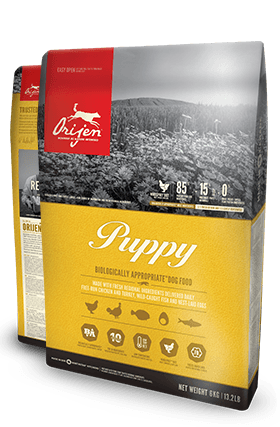 Overall, Orijen’s puppy food is a fairly good alternative, and their approach “biologically appropriate” dog food is nice. As I see it, they don’t quite follow through with it in their recipes, but are still doing a much better job than most other brands. Acana is another brand by Champion Petfoods. It’s cheaper than Orijen, and of course there’s a reason for that. While Orijen has a meat inclusion of 85%, Acana in their Heritage line has 60-75%. In Acana, a larger proportion of the protein comes from beans and lentils compared to Orijen. I don’t agree that this qualifies as biologically appropriate, but this term is used for Acana as well. So how does this affect the carbohydrate content? Well, at 23% (27% for large breed variety) it’s still moderate compared to many other dry dog food brands. But, compared to Ketona’s 8% it’s a huge amount. Another thing about the ingredients is the fact that Acana uses chicken and turkey meal (26% of the ingredients) instead of only fresh or dehydrated meat like in the Orijen food. 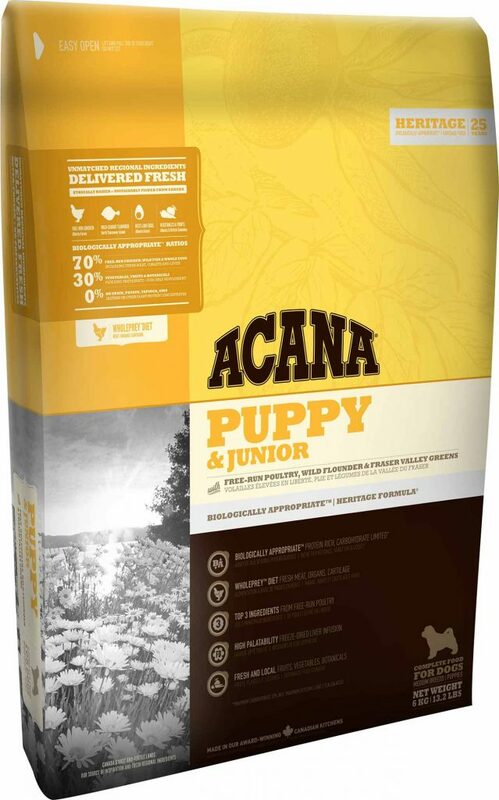 Acana Heritage puppy food comes in three varieties: Small Breed, Puppy & Junior, and Large Breed. As you can see, there is no actual difference between the first two varities. For both varieties energy content is 439 kcal per 250ml/120g cup. The only differences I can find are small variations in the vitamin levels, but given that no supplements are added those levels most likely vary between batches. Energy content is 405 kcal per 250ml/120g cup. This means only about 8% less energy than in the small breed puppy food. Not as much of a difference as in Orijen’s large breed variety, but still less, which is good. Only additives are chelated zinc and vitamin E in all three varieties. Oddly enough, all three have the AAFCO profile “All life stages”. It’s kind of hard, at least to me, to understand why they have an option named small breed. My guess is it’s for marketing purposes. 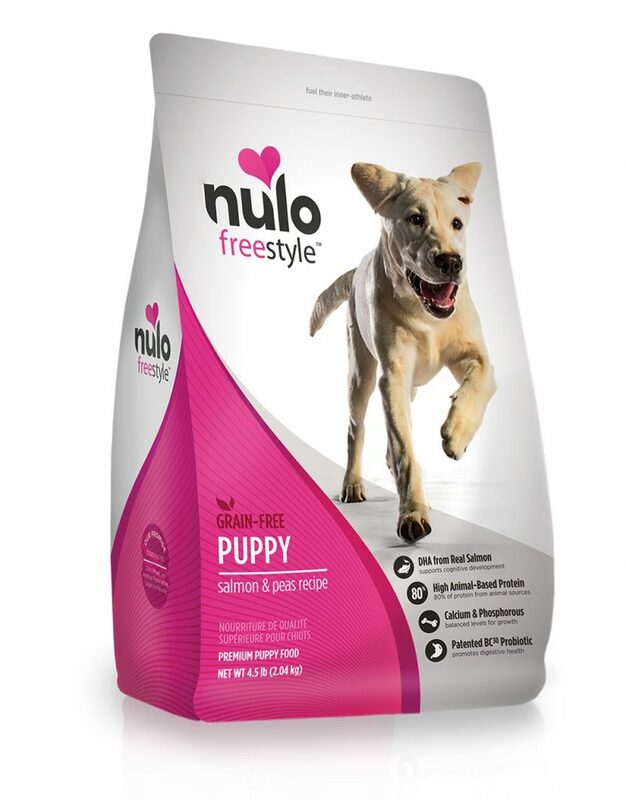 Nulo has a good reputation and, much like Ketona, claims to provide dog and puppy food that is free from carbohydrate fillers and is adapted to suit the carnivores that our dogs are. The company also emphasizes the importance of glycemic index. The higher the index, the faster the food’s energy in form of glucose enters the blood stream and raises the insulin levels. But, no matter the glycemic index, carbohydrates are still not a part of the natural diet for a wolf or a dog if you ask me. Nulo puts sweet potatoes in their puppy food. The exact amount is not specified, but it’s high up in the ingredient list. First six ingredients are deboned salmon, turkey meal, menhaden fish meal, whole peas, chicken Fat (preserved with mixed tocopherols & citric acid), sweet potato. Sweet potatoes are still a much better choice than white potatoes that some grain-free dog foods contain. They have more fibers and, to follow through with Nulo’s own aspirations, a much lower glycemic index. The AAFCO profile is “growth and gestation/lactation”. There are no special varieties for small or large breeds, but at 441 kcal/cup it’s perhaps not the best choice for large breed puppies. Three chelated minerals are supplemented: zinc, iron and copper. Several vitamins are also added. Note: Nulo has one more recipe for puppies in the Freestyle line: Turkey & Sweet Potato. Also note that both recipes actually have sweet potatoes and peas among the ingredients. Nature’s Variety’s Instinct brand is the last of the grain free foods for puppies to be reviewed. A nice feature of this is the so called Raw Boost, freeze-dried raw chicken bits. Should be very appetizing for the pup! As for the nutrient content it’s not a big deal though. One thing I don’t like about this food is that it contains tapioca, that appears before the raw chicken in the ingredient list. Tapioca is nothing but a filler in the food, it has no nutritional purpose. And, to pick up on Nulo’s glycemic index thinking, it’s extremely high up on that scale. Apart from this they are doing a pretty good job concerning the carbohydrate content. Remember though that this is in comparison with other dog food brands on the market. First six ingredients are chicken, chicken meal, turkey meal, peas, chickpeas, egg product (what is that?). With as much as 517 kcal/cup this food is not recommended for large breed puppies. This is also stated in the AAFCO profile that says “growth except for growth of large size dogs (70 lbs or more as an adult)”. Four chelated minerals are added, zinc, iron, copper, and manganese, as well as a number of vitamins. This article is about finding the best grain-free puppy food. Because of this I have not dived deep into the vitamin and mineral contents of the brands I have picked out. However, they all comply with the AAFCO standards, so all nutrients ought to be up to par with the demands of your puppy. Since carbohydrates are not a part of the diet wolfs and dogs have evolved to thrive on, the carbohydrate content has been my main focus here. There is no doubt that Ketona is the winner. With a carbohydrate content of about 8% it has way less of that for a dog completely nonessential nutrient than any of the other brands. But if your dog appears healthy and happy eating from one of the other brands listed here, they are also a decent choice. Compared to many other dry dog food brands all of the above have carbohydrate levels below average. Enjoyed this article? Then you might want to read about the best puppy food too! PrevPreviousDoes My Dog Miss Me? The Expert Answer!